Fines for unsanctioned polls. The House of Representatives approved in the first reading a bill of amendments, which would establish administrative liability for non-licensed public opinion surveys. The fine would in particular be established for “illegal” polls asking people about their opinion about political situation the country, a national referendum, or parliamentary and presidential elections. It would equal 20 base rates (about $240) for individuals and up to 100 base rates (about $1,200) for legal entities. New IISEPS survey. In June, the Independent Institute of Socio-Economic and Political Studies (IISEPS) conducted a survey of public opinion on major issues of life of Belarusians. 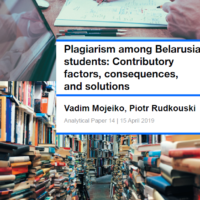 In particular, the experts observe stabilization of the "economic health" of Belarusians, but also an increasing number of people who believe that Belarus needs changes (77.3%). Also, Alexander Lukashenka's electoral rating has dropped to 29.7% compared to March (34.5%). Council of the Republic adopted the draft law on KGB. On June 22, the upper house of Parliament adopted the draft law "On the State Security Bodies of Belarus". The law establishes the basic tasks, activities of state security, the responsibilities of the president and government in the field of the state security. The bill defines the conditions and limits of the security organs with regards to physical force, special equipment, weapons and military equipment. Art-Siadziba ousted. Pavel Belavus, the Art-siadziba director, was summoned by the premises owner (the administration of the Horizont plant) that they must leave the office by July 23 and that their contract that had to expire at the end of October has been cancelled. The reason for it was the fact that they violated fire safety and numerous other regulations. Amnesty International declares Pochobut prisoner of conscience but he is released shortly. In a statement on June 26, Amnesty International has declared Belarusian journalist Andrzej Poczobut a prisoner of conscience detained solely for exercising his right to freedom of expression. On June 30, Andrey Pochobut was released from the Grodno prison under travel ban. Opinion of animal defenders taken into account. The claims of CSOs involved in animal protection, as well as ordinary citizens were taken into account and the draft law "On the treatment of animals" was sent back for revision. It was reported by the internet community "Right to Life." Uruccha protesters dispersed by police. Leanid Mazhalski, one of the leaders of a group of people protesting against a infill construction in Uruccha city district was detained in Minsk on July 5. The hearings in court are scheduled for July 17. It should be noted that inhabitants of Minsk protested against the construction of six blocks of flats for riot policemen in the district. The construction works are going on in spite of their protests. National Gender Policy Council’s structure approved. The Council of Ministers approved internal regulations of the National Council for Gender Policy. Along with numerous government officials, the Council will include representatives of at least three women CSOs: Gender Perspectives, Young Christian Women Association and Women’s Independent Democratic Movement. The draft law on state social contracting adopted by the Parliament. On June 27, the House of Representatives adopted the amendments to some laws on social service. One of the most important parts of the bill is introduction of the mechanism of social contracting that allows nonprofit organizations to get funding from the state budget. Deputy Minister participated in the CSO training. On June 26-27, NGO "ACT" together with Mogilev oblast executive committee held a training on "Social contracting basics" for Mogilev officials. Among the speakers there were the deputy chairman of the Mogilev Regional Executive Committee Valery Malashko, as well as Deputy Minister of Labour and Social Affairs Alexander Rumak. EU creates pro-democracy fund. On June 25, EU member states agreed to create a European endowment for democracy aimed to encourage "deep and sustainable" change in societies struggling under oppressive regimes, EU observer informs. The fund should become operational by next year and will primarily target EU neighbouring countries such as Belarus, where people are routinely jailed for showing opposition to President Alexander Lukashenka. PACE committee statement on Belarus. The Committee on Political Affairs and Democracy of the Parliamentary Assembly of the Council of Europe (PACE), in a statement on June 26, urged the Belarusian authorities to "open up political space" ahead of September's parliamentary elections. The statement called on the Belarusian leadership to promote a democratic and fair parliamentary campaign and to ensure freedom of expression, association and assembly, as well as political rights for all opposition movements. Ashton calls on authorities to stop harassment of opponents. In a statement on June 29, EU foreign policy chief Catherine Ashton has called on the authorities in Belarus to stop the harassment of the opposition, media and civil society, expressing deep concern at a number of recent incidents. Worst of the Worst 2012. A new Freedom House report "Worst of the Worst 2012: The World’s Most Repressive Societies" highlights those countries that earned the lowest possible scores (Worst of the Worst) or fell just short of the bottom scores (On the Threshold) in Freedom in the World 2012, Freedom House’s annual global assessment of political rights and civil liberties. Belarus was deemed to be “On the Threshold” together with Burma, Chad, China, Cuba, Laos, and Libya. Linas Linkevicius appointed as Lithuanian new ambassador to Belarus. Linas Linkevicius, a former Lithuanian defense minister, has been appointed as the Baltic state's new ambassador to Belarus, said a spokesperson for the Lithuanian embassy in Minsk on July 5. UN appointed a special rapporteur on Belarus. On July 5, the United Nations' Human Rights Council adopted a resolution and agreed to appoint a special rapporteur to monitor the situation of human rights in Belarus and to make recommendations for its improvement. The 47-nation council voted to create the post, as proposed by the European Union, by 22 votes to 5, with 20 abstentions. Belarus does not recognize the mandate of the UNHRC Special Rapporteur on Belarus and will not cooperate with him, the press service of the Foreign Ministry of Belarus said. Belarusian envoy speaks against the appointment of rapporteur on Belarus at UN Human Rights Council. Mikhail Khvastow, Belarus' permanent representative to the UN Office in Geneva, said on June 28 during a session of the UN Human Rights Council that there was no need for the appointment of a special rapporteur on Belarus.